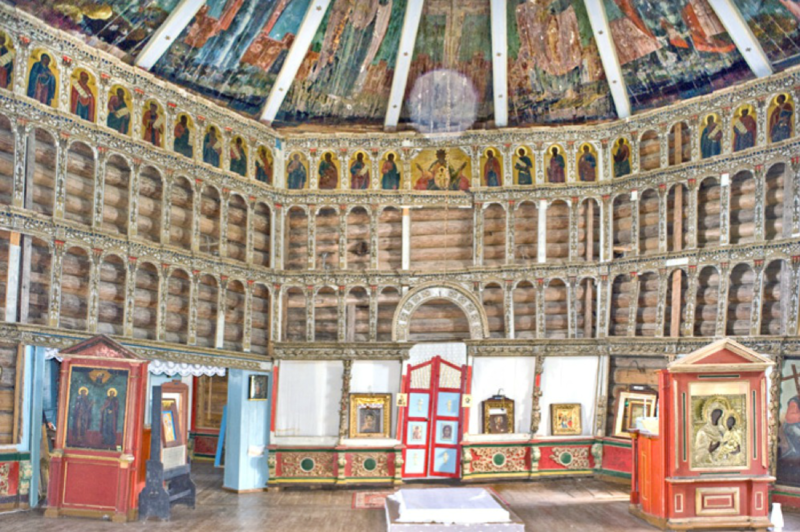 The interior paintings of this structure, unique among the wooden churches of the far North, indicate a continuity in Russian art from the 18th century to the present day. 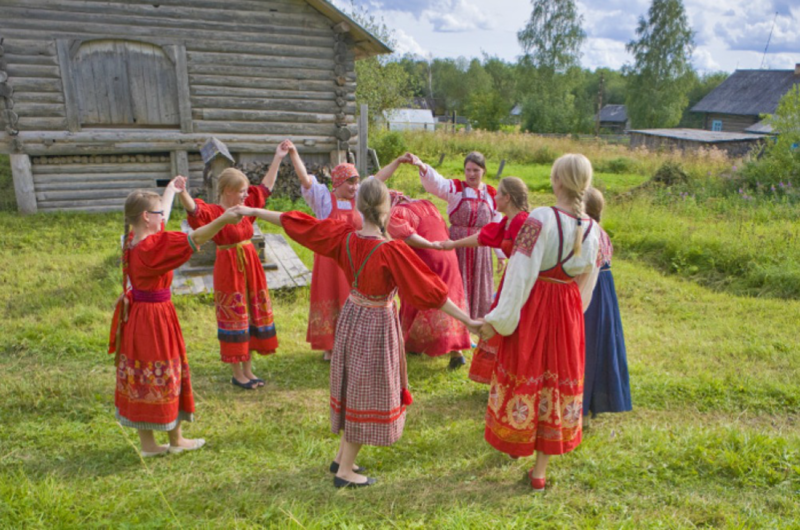 The historic Russian North, centered on the White Sea, has long been known as a repository of traditional arts and crafts. Among the most distinctive displays of this artistic culture are a few surviving wooden churches with 18th and 19th century painted interiors that combine religious piety and emotional expression. 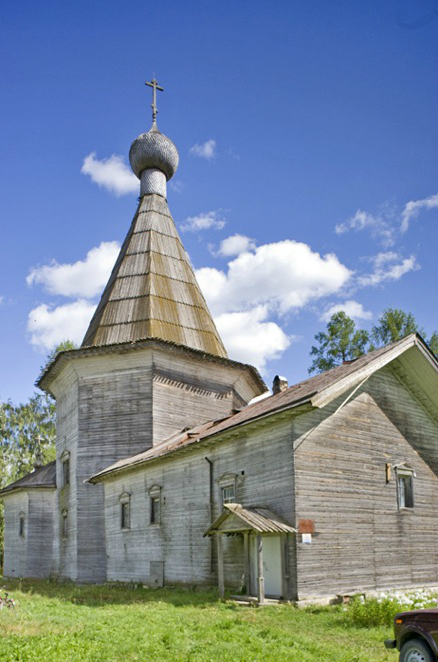 The best example still standing is the Church of the Epiphany at the village of Oshevensk in the Kargopol region of Arkhangelsk Province. 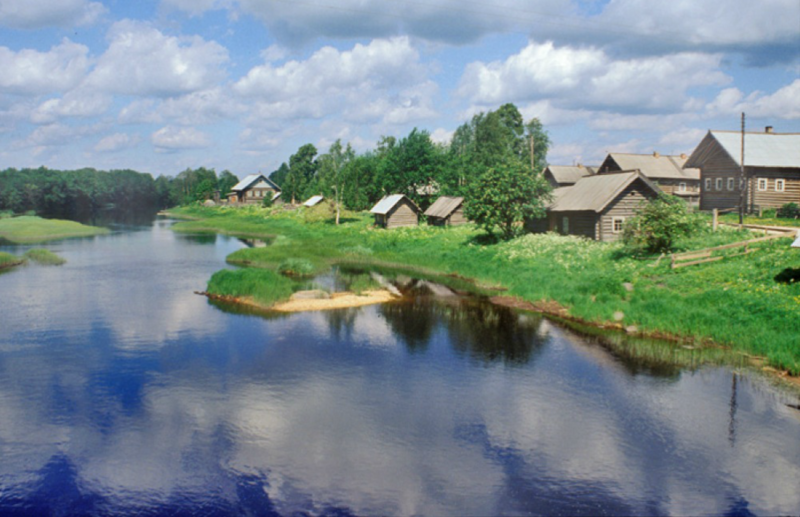 Oshevensk is in fact a cluster of settlements, including three hamlets picturesquely situated along the Churyega River. The Epiphany Church is located in the first hamlet, Pogost, a name derived from a term for sacred ground that usually contained a cemetery and church. Built of sturdy pine logs in 1787, the Epiphany church is an unsurpassed combination of structure and art in the Russian north. (The church is also referred to locally as the Baptism, as Epiphany and the Baptism of Christ are the same holiday in Orthodoxy.) Octagonal in shape, the main structure of the church is crowned with a tall “tent” tower. The church bell tower stands separately to the northwest with its own vertical cap. The two complement each other in serene harmony. Yet the miracle of this church is its interior, which encompasses one of the largest such spaces among northern log churches. Its icon screen is enormous in extent, yet few of the icons remain. The church was closed in the 1930s, opened during World War II, and closed again in 1960 during Nikita Khrushchev’s “final” campaign against religion. The church was reopened for prayer and occasional services in the late 1990s. During this long period of closure, most of the icons in the main iconostasis were taken from the church. The icons in the uppermost row, dedicated to the Prophets, survived, but in October 2014, the church was broken into and these remaining icons were stolen. Only the magnificent carved icon screen remained. Although most of the icons have now been recovered, much work remains to restore them to their original place. 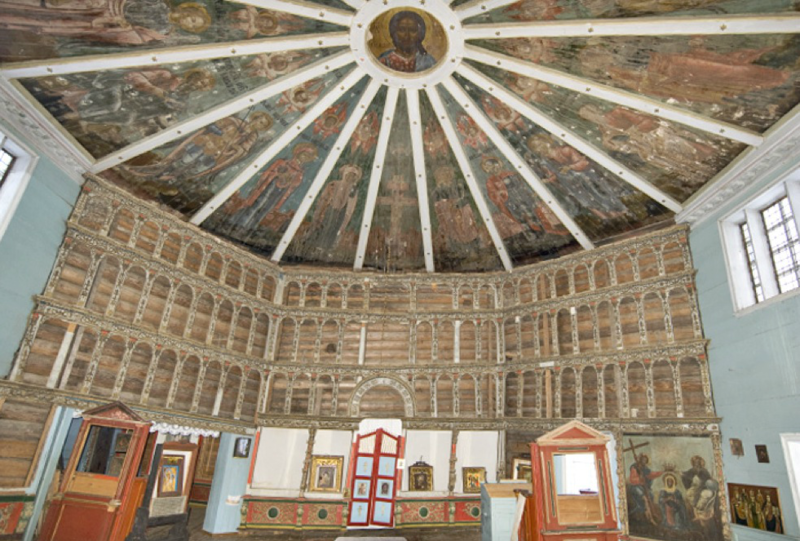 The most impressive display of art in the interior is the painted suspended ceiling, or "heaven" (nebo), which still has its panels in place, although with sporadic damage to the painted surface. The basic form of the "heaven" is a polygon segmented by flat beams extending from the top of the walls to a ring in the center. The beams are slightly inclined and thus create a frame that is self-supporting between the walls and the ring. The painted panels are in the shape of extended triangles and are laid upon the frame without fasteners. The design makes ingenious use of tension and gravity. These “heavens” are a distinctive feature of the traditional North, a combination of painting and structure. The paintings at the Epiphany Church have been attributed to the Bogdanov-Karbatovsky family, one of the dynasties of icon painters active in the Arkhangelsk territory in the latter half of the 18th century. They were also involved in the painting of the icons for the monumental icon screen of the Kargopol Nativity Cathedral, rebuilt after a major fire in 1765. Such artists brought new expressiveness to a traditional art in transition from tempera colors to oil paints. The “heaven” at the Epiphany church is uniquely large, with 18 panel segments that include eight archangels, the four evangelists, the Crucifixion and heavenly forms such as seraphim. 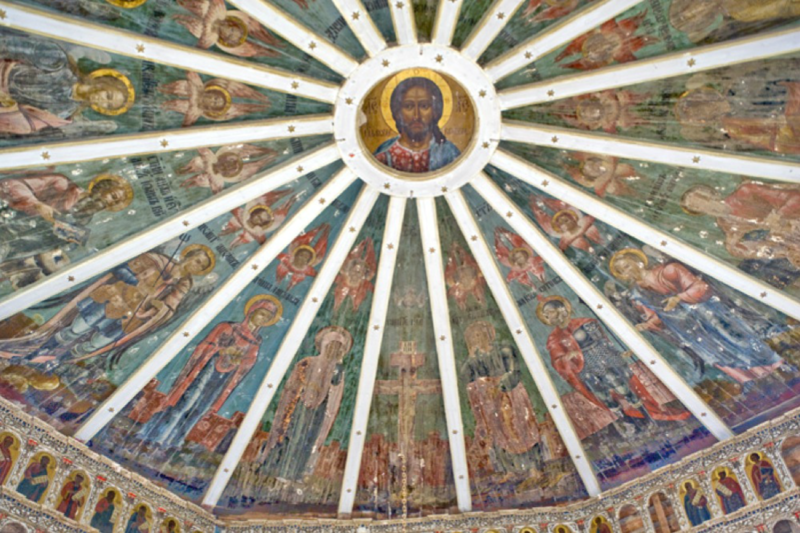 The central ring is occupied by an image of Christ Pantocrator (Ruler of All). The panel rising from the center of the icon screen depicts Christ on the cross. The panel to the right of Christ (the viewer’s left) contains Mary, Mother of God (Theotokos). The panel to the left of Christ depicts St. John the Evangelist, author of one of the canonical Gospels and thus a divinely inspired witness to the Crucifixion. Each panel of the entire ceiling has the name of the person depicted painted in bold black letters. Next to Mary Theotokos stands Mary Magdalene. As a close follower of Jesus, she is mentioned several times in the Gospels and stood at the foot of the cross. She also appears in all four Gospels as a central person in the Resurrection narrative. Although both figures are depicted in blue robes symbolizing purity, Mary Magdalene is also clad in a crimson cloak. St. John the Evangelist is flanked by Longinus the Centurion, the name given in medieval Christian sources to the Roman soldier who pierced the side of Christ with his spear. Longinus was canonized by both the western and eastern churches for his witness to and proclamation of the divinity of Christ. The bright red cloak that he wears over his armor creates symmetry with the cloak of Mary Magdalene. This arrangement of five central figures, typical for Orthodox depictions of the Crucifixion, is flanked by panels containing the two main archangels, Michael (in the panel next to Mary Magdalene) and Gabriel. As the supreme archangel (arkhistratig), Michael leads the Hosts of the Lord against Satan’s army in the Book of Revelation. As a symbol of his militant power, he is portrayed in armor with a red cloak. His right hand holds a lance, here given the atypical form of a trident. Gabriel, portrayed more modestly, is God’s primary messenger, most notably in the Annunciation. The eastern half of the ceiling concludes with portrayals of the Evangelists Matthew (in the panel next to Archangel Gabriel) and John the Evangelist. This is the second representation of St. John: first as a witness to the Crucifixion and secondly as one of the four Evangelists. The western half of the nebo continues with other archangels in the Eastern Orthodox tradition including Selaphiel, who is often seen as an intercessor between God and the worshipper. Next to Selaphiel is Archangel Uriel, traditionally associated with various human endeavors such as the arts. Here Uriel is portrayed accompanying the boy Tobias, son of Tobit from the Book of Tobit. The boy holds a fish that he caught and that will subsequently play a role in the narrative of this complex legend. Usually it is Archangel Raphael (the healer) who accompanies Tobias, but the letters on the panel clearly spell “Uriel. Also included among the western panels are the Evangelists Mark and Luke, as well as the Archangel Jegudiel. The central part of the western half of the nebo consists of three panels featuring archangels Barachiel, Selaphiel and Michael. This is the second depiction of Archangels Selaphiel and Michael, a repetition called forth by the unusually large number of panels in the Epiphany Church ceiling. In addition to the main altar (behind the icon screen), the Epiphany Church has two additional altars dedicated to St. John the Divine and the martyr St. Vlasy that have miniature versions of the “heaven” painted ceilings. For heated winter worship in this severe climate, a refectory with the altar of St. John the Divine extends from the west of the main structure. The miraculous paintings at the Oshevensk Epiphany Church are in urgent need of preservation. Valuable in themselves, they also suggest a continuity in Russian art extending to the major 20th-century artist Natalya Goncharova -- for example, her work entitled “The Four Evangelists.” In each case we see both clarity and depth of expression, fluidity of line, delicate shading and a radiant expressiveness.